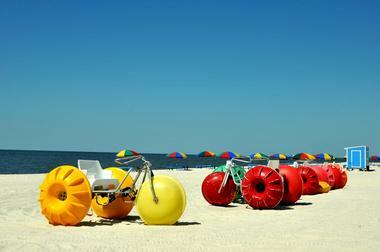 Gulfport is one of the best beach resort towns in all of America. Many miles of coastline stretch out in both directions, and the nearby barrier islands like Cat Island and Horn Island add something very special to this stretch of shore. If you’re planning a trip to Gulfport, MS and want to enjoy the best beaches in the area, read on to learn all about them. The premier beach of the city of Gulfport, Gulfport Beach has been beloved by many generations of beach-goers over the years for its simple beauty and cleanliness. It's an ideal spot to simply sit back with a good book and relax, listening to the sounds of the waves and feeling the warmth of the sun on your skin. If you want to be a little more active, however, Gulfport Beach also features its own fishing pier, with a lot of different species being caught in the Gulf of Mexico waters, and other activities like jet skiing and swimming can be enjoyed here too. Gulfport Beach is also known for never really getting too busy, so it always has a calm, quiet atmosphere, a far cry from the noisy, busy beaches elsewhere along the Gulf Coast. 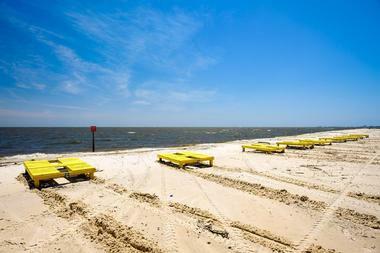 Biloxi beach is perhaps the most famous beach in the Gulfport area. Just a short ways east of the city, Biloxi is one of the oldest settlements in all of Mississippi, being founded back in 1699. The city is well-known for its casinos, restaurants, and other tourist attractions which are all located just a short walk off the beach itself. Fishing, boating, swimming, and simple relaxation can all be enjoyed on this beach, with Biloxi Beach being well-known as one of the best sport fishing spots on the Gulf of Mexico coastline. 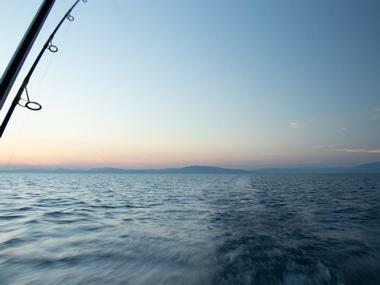 All kinds of species can be caught in these waters including mackerel, snapper, redfish, and trout. But if you’re not into fishing, there’s plenty more to enjoy at Biloxi Beach, with pontoon, jet skis, kayaks, and paddleboards all being offered for rental. The Betsy Ann Riverboat runs old-fashioned tours along the water too, and the old Biloxi Lighthouse is open to visitors. Ship Island is actually the name given to two of the barrier islands just off the coast of Gulfport: East Ship Island and West Ship Island. Both islands can only be reached by boat, with the west island being more accessible due to regular ferry crossings from Gulfport. You'll have to pay a little fee to reach West Ship Island, but the beaches are more than worth it. There's also a lot of history on this island, with Fort Massachusetts being built here in the mid-19th century and still remaining standing in the modern era. Tours of the fort are organized regularly and can be reserved, offering a unique experience that history lovers will adore. You can also enjoy all of the traditional beach activities here like fishing, swimming, and sunbathing. 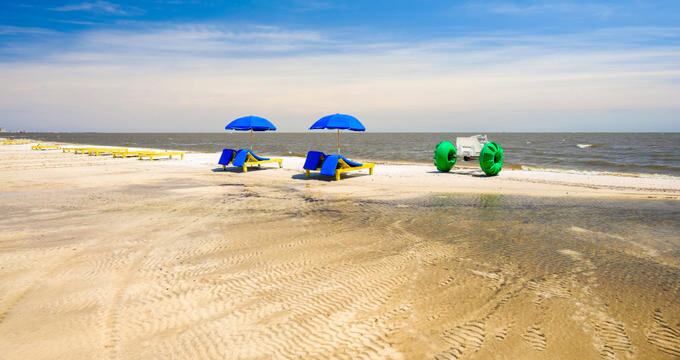 Bay St. Louis is located just slightly west of Biloxi, only a short journey away from Gulfport, and it's definitely worth the trip for beach-lovers. The town itself is a joy to explore, with a nice historic district filled with antique stores and some great dining opportunities at Bay St. Louis' various eateries. The local harbor is lovely to walk around, and the beach itself is simply gorgeous. It's a great spot to gather in the evenings for a relaxing walk through the soft sand as the setting sun fills the sky with different shades of orange and red, and it's a super spot in the daytime too, with lots of good fishing and swimming opportunities. There are an astonishing array of breathtaking beaches to be found all around the United States, and the Mississippi Gulf Coast is generally regarded as one of the very best spots. Gulfport, MS sits at the heart of this region, with lots of beautiful beaches to be found in and around the state’s second biggest city. Whether you're looking to simply relax and soak up the sunshine with friends and family or try something more active like kayaking, fishing, swimming, or surfing, Gulfport will have a lot of options for you to choose from, with plenty of additional attractions in the local area. There's nothing quite as relaxing as heading out to the beach. It's one of the oldest pastimes in the world, but relaxing on the soft sands and admiring the ocean views is simply unbeatable, and beaches offer all kinds of additional activities and opportunities too, from surfing and kayaking to swimming, shelling, and engaging in fun games like volleyball. With the Pacific Coast on one side, the Atlantic Coast on the other, and the incredible Gulf of Mexico to the south, the United States of America is blessed with one of the longest and most beautiful coastlines of any country in the world.